Micrograph of splenic tissue showing the red pulp (red), white pulp (blue) and a thickened inflamed capusule (mostly pink - top of image). H&E stain. ଅଧିକ ବି-ଲିମ୍ଫୋସାଇଟ ଥିବା "ଲିମ୍ଫଏଡ ଫଲିକ୍ଳ" କିମ୍ବା "ଫଲିକ୍ଳ"
ଅଧିକ ଟି-ଲିମ୍ଫୋସାଟ ଥିବା "ପେରିଆର୍ଟେରିଆଲ ଲିମ୍ଫାଏଡ ସିଥ (PALS)"
↑ ୩.୦ ୩.୧ Mebius, RE; Kraal, G (2005). 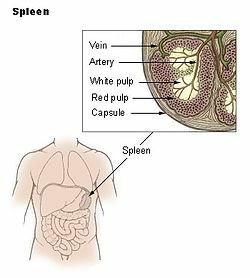 "Structure and function of the spleen". Nature reviews. Immunology. 5 (8): 606–16. doi:10.1038/nri1669. PMID 16056254. ↑ ୪.୦ ୪.୧ ୪.୨ Swirski, FK; Nahrendorf, M; Etzrodt, M; Wildgruber, M; Cortez-Retamozo, V; Panizzi, P; Figueiredo, JL; Kohler, RH; Chudnovskiy, A; Waterman, P; Aikawa, E; Mempel, TR; Libby, P; Weissleder, R; Pittet, MJ (2009). "Identification of splenic reservoir monocytes and their deployment to inflammatory sites". Science. 325 (5940): 612–6. doi:10.1126/science.1175202. PMC 2803111. PMID 19644120. ↑ Jia, T; Pamer, EG (2009). "Immunology. Dispensable but not irrelevant". Science. 325 (5940): 549–50. doi:10.1126/science.1178329. PMC 2917045. PMID 19644100. ↑ Carey, Bjorn (May 5, 2006). "Horse science: What makes a Derby winner - Spleen acts as a 'natural blood doper,' scientist says". MSNBC.com. Retrieved 2006-05-09. ↑ "Spleen: Information, Surgery and Functions". Childrens Hospital of Pittsburgh - Chp.edu. 2010-11-17. Retrieved 2011-04-03.